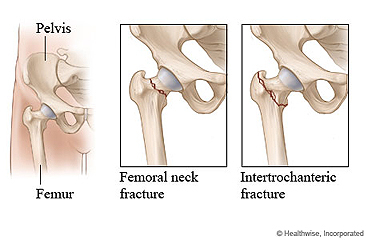 Surgery for a hip fracture repairs a broken hip bone. When you leave the hospital after surgery, you will probably be walking with crutches or a walker. You may be able to climb a few stairs and get in and out of bed and chairs. But you will need someone to help you at home for the next few weeks or until you have more energy and can move around better. If there is no one to help you at home, you may go to a rehabilitation centre or long-term care centre. You will go home with a bandage and stitches or staples. You can remove the bandage when your doctor tells you to. Your doctor will remove your stitches or staples 10 days to 3 weeks after your surgery. You may still have some mild pain, and the area may be swollen for 3 to 4 months after surgery. Your doctor will give you medicine for the pain. You will continue the rehabilitation program (rehab) you started in the hospital. The better you do with your rehab exercises, the quicker you will get your strength and movement back. Most people are able to return to work 4 weeks to 4 months after surgery. But it may take 6 months to 1 year for you to fully recover. Some people, especially older people, are never able to move quite as well as they used to. Rest when you feel tired. You may take a nap, but do not stay in bed all day. Work with your physiotherapist to learn the best way to exercise. You may be able to take frequent, short walks using crutches or a walker. You will probably have to use crutches or a walker for at least 4 to 6 weeks. After that, you may need to use a cane to help you walk. Do not sit for longer than 30 to 45 minutes at a time. When you sit, use chairs with arms, and do not sit in low chairs. Sleep on your back with your legs slightly apart or on your side with a pillow between your knees for about 6 weeks or as your doctor tells you. Do not sleep on your stomach or affected hip. You may need to take sponge baths until your stitches or staples have been removed. You will probably be able to shower 24 hours after they are removed. Ask your doctor when it is okay to bathe or shower. Most people are able to return to work 4 weeks to 4 months after surgery. Do not lift anything that would make you strain. This may include heavy grocery bags and milk containers, a heavy briefcase or backpack, cat litter or dog food bags, a vacuum cleaner, or a child. By the time you leave the hospital, you will probably be eating your normal diet. If your stomach is upset, try bland, low-fat foods like plain rice, broiled chicken, toast, and yogurt. Your doctor may recommend that you take iron and vitamin supplements. If you take warfarin, make sure you get about the same amount of vitamin K each day. This will help blood thinners work evenly from day to day. An example of food that is high in vitamin K is leafy green vegetables. Eat healthy foods, and watch your portion sizes. Try to stay at your ideal weight. Too much weight puts more stress on your hip joint. Your doctor may want you to take calcium supplements and eat foods high in calcium, such as milk, cheese, ice cream, and salmon with bones. These help stop bone loss. Orange juice and soy beverage with added calcium are also good choices. Your doctor may give you a blood-thinning medicine to prevent blood clots. If you take a blood thinner, be sure you get instructions about how to take your medicine safely. Blood thinners can cause serious bleeding problems. This medicine could be in pill form or as a shot (injection). If a shot is necessary, your doctor will tell you how to do this. Your doctor may also prescribe medicines or calcium supplements to make your bones stronger. You will have a bandage over the cut (incision) and staples or stitches. If there is no drainage, most doctors will let you take the bandage off in a few days. Your doctor will remove the staples or stitches 10 days to 3 weeks after the surgery and replace them with strips of tape. Leave the tape on for a week or until it falls off. Your rehab program will include a number of exercises to do. Always do them as your therapist tells you. Do not do any vigorous exercise for 12 weeks or until your doctor tells you it is okay. For pain, put ice or a cold pack on the area for 10 to 20 minutes at a time. Put a thin cloth between the ice and your skin. Your ankle may swell for about 3 months. Prop up your ankle when you ice it or anytime you sit or lie down. Try to keep it above the level of your heart. This will help reduce swelling. Continue to wear your support stockings as your doctor says. These help to prevent blood clots. The length of time that you will have to wear them depends on your activity level and the amount of swelling you have. Most people wear these stockings for 4 to 6 weeks after surgery. Arrange furniture so that you will not trip on it. Get rid of throw rugs, and move electrical cords out of the way. Walk only in areas with plenty of light. Put grab bars in showers and bathtubs. Avoid icy or snowy sidewalks. Wear shoes with sturdy, flat soles. Your leg or foot is cool or pale or changes colour. You cannot feel or move your leg. Your incision comes open and begins to bleed, or the bleeding increases. You feel like your heart is racing or beating irregularly. Enter R412 in the search box to learn more about "Surgery to Repair a Hip Fracture: What to Expect at Home".